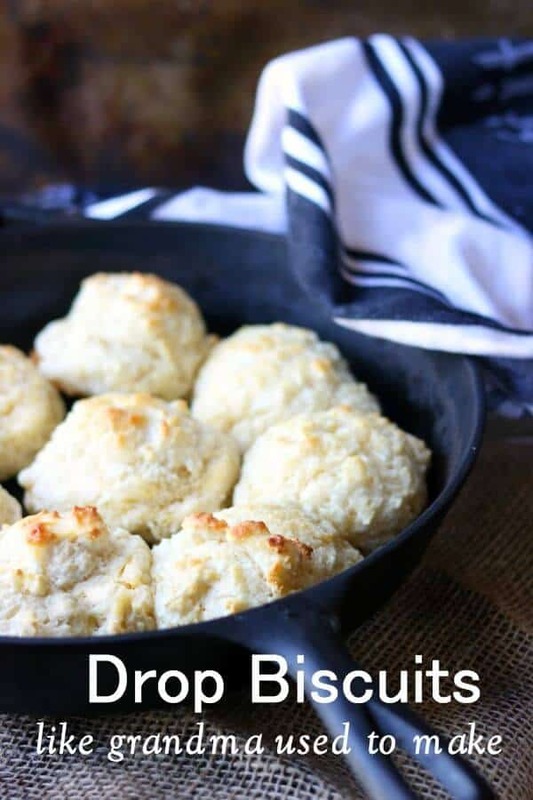 Homemade drop biscuits are so easy that you can have them pretty much every night! Since there’s no kneading or rolling to be done they don’t make much of a mess AND you can’t overwork them! They always rise high and light and tender! 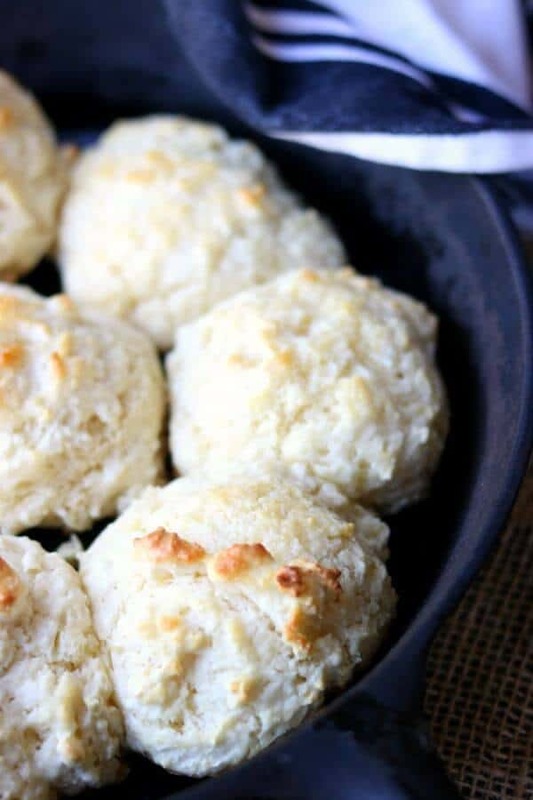 Drop biscuits from scratch have a buttery, bigger taste then those from a mix – try it and see! Pretty much every one I know has a recipe for drop biscuits. If you’re from the South the recipe probably calls for White Lily self-rising. It’s just a fact. My mom wasn’t a baker but during strawberry season she made enough drop biscuits for shortcake to fill Jacob’s Well. Not the real well, y’all. The swimming hole down south of where I live. It’s pretty close to Austin. Anyway, she always made drop biscuits because it was quick and easy. She could come in from working outside and stir up the biscuits and be back outside in 30 minutes start to finish. Then we had strawberry shortcake for supper. As much as we wanted and as much as we could eat. Those are NOT the same things, by the way. I always wanted more than I could eat. 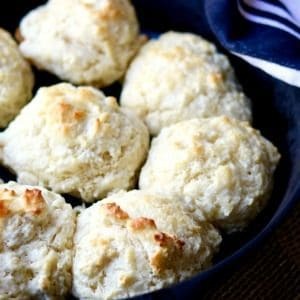 As far as I knew everyone’s mom had a recipe for drop biscuits and there was really no reason to publish one. Well, like so many other times in my life I was wrong. I got to talking with someone a few weeks ago and they were bemoaning the fact that they missed their grandmother’s drop biscuits and that none of the recipes they’d found tasted like hers. So I dug out my recipe, and by dug out I mean I sifted through the memory portion of my brain where I store recipes, and I gave it to her with instructions to make it exactly as written AND to let me know what she thought. Ok y’all, about that memory portion of my brain – when I get old (not like now but like when I’m 97) and start losing my memory I’m pretty sure that the only things I’ll retain are recipes. Anyway – so she got back to me and she was so excited because they absolutely tasted like her grandmas. Honestly, I didn’t doubt it for a minute. 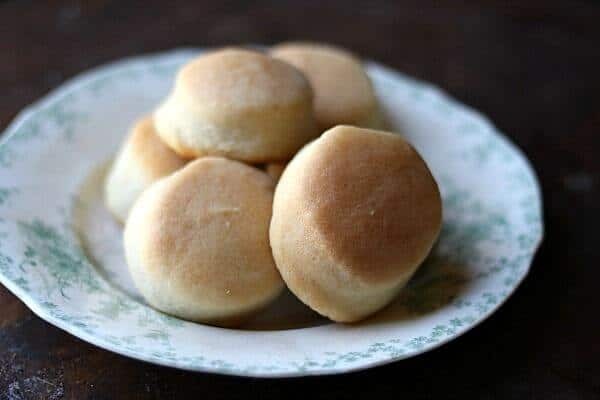 You know, drop biscuits are super easy but if you don’t have a lot of biscuit experience you can miss some of the things that us older folks just do out of habit. 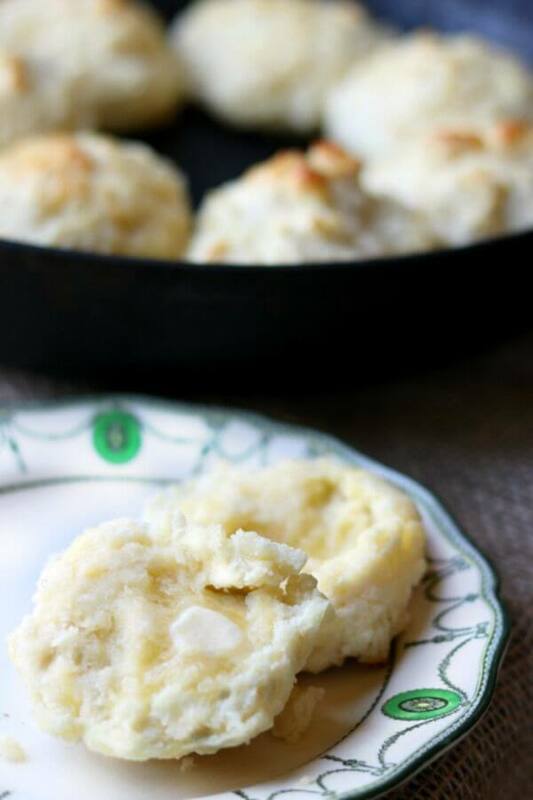 Here are a few tips that will help ensure light, fluffy drop biscuits. Use White Lily Self Rising flour. I know, you think all flour is the same but this has been a staple in Southern kitchens for eons – and they’re not paying me so I’m just telling you. Buttermilk. Not milk with lemon juice or vinegar. Not buttermilk powder. Preheat the oven all the way before you even start mixing the biscuits. Whatever you do don’t let the batter sit on the counter once the liquid goes in it. The quicker you get it in the oven the better it will be. Do not use low fat anything or margarine. Some Southern cooks use Crisco as a stand in for the lard Grandma used to use. I don’t and I’d suggest just going with butter. Mix the ingredients quickly with a fork. You don’t want the gluten to develop. You’ll still see long shreds of butter – that’s what you want. Use a 1/4 cup size scoop to keep them uniform. If you don’t have a scoop use a 1/4 cup measure. White Lily Flour is in about every grocery store in my area but if you live up north then you might not be able to find it. Thank God for Amazon, right? You’re going to love these! Any kind of homemade biscuit is at it’s best straight out of the oven so that the steam fogs up your glasses when you open it up. Either freeze leftovers or use them for bread crumbs – warmed up biscuits are just not right. 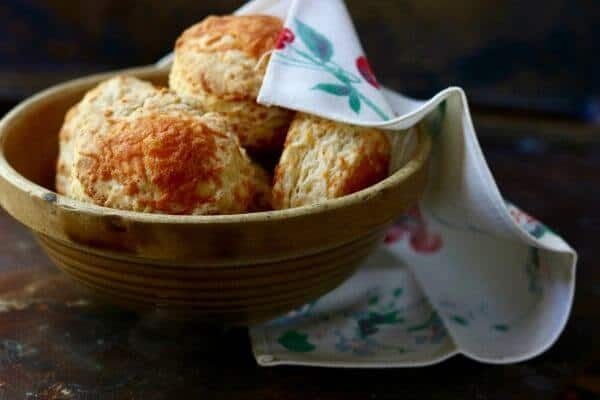 Since there’s no kneading, rolling, or cutting to be done these old fashioned biscuits go together fast and bake up light and fluffy! Preheat the oven to 475F with an iron skillet in it if you plan to use a skillet for baking. While the oven is preheating add flour to a mixing bowl. Using the big holed side of a grater, grate the butter into the flour and stir to make sure the butter isn’t in just one spot. Pour in 2/3 of the buttermilk and stir lightly with a fork – just until the dough leaves the sides of the bowl. You may need a little more buttermilk. Carefully, using a hot pad, remove the iron skillet from the oven to a heat proof surface. Brush the skillet with bacon grease. If you’re using a skillet drop the biscuits by 1/4 cup measure into the skillet, leaving a little room between each. If you’re not using a skillet drop the biscuits onto a greased, heavy baking sheet. Bake for 8 to 12 minutes, or until golden brown and cooked through.